We have seen many graphs that are expressed as single equations and are continuous over a domain of the Real numbers. We have also seen the "discrete" functions which are comprised of separate unconnected "points". There are also graphs that are defined by "different equations" over different sections of the graphs. These graphs may be continuous, or they may contain "breaks". Because these graphs tend to look like "pieces" glued together to form a graph, they are referred to as "piecewise" functions (piecewise defined functions), or "split-definition" functions. A piecewise defined function is a function defined by at least two equations ("pieces"), each of which applies to a different part of the domain. Piecewise defined functions can take on a variety of forms. Their "pieces" may be all linear, or a combination of functional forms (such as constant, linear, quadratic, cubic, square root, cube root, exponential, etc.). Due to this diversity, there is no "parent function" for piecewise defined functions. The example below will contain linear, quadratic and constant "pieces". Notice that each "piece" of the function has a specific constraint. 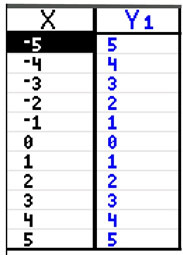 Notice that the "changes" focus around the x-values of 1 and -1. ♦ Hint: When graphing, focus on where the changes in the graph occur. From x-values of -∞ to -1, the graph is a straight line. From x-values of -1 to 1, the graph is constant. From x-values 1 to ∞, the graph is quadratic (part of a parabola). The piecewise function shown in this example is continuous (there are no "gaps" or "breaks" in the plotting). In this example, the domain is all Reals since all x-values have a plotted value. Still confused about what is happening in these piecewise defined functions? 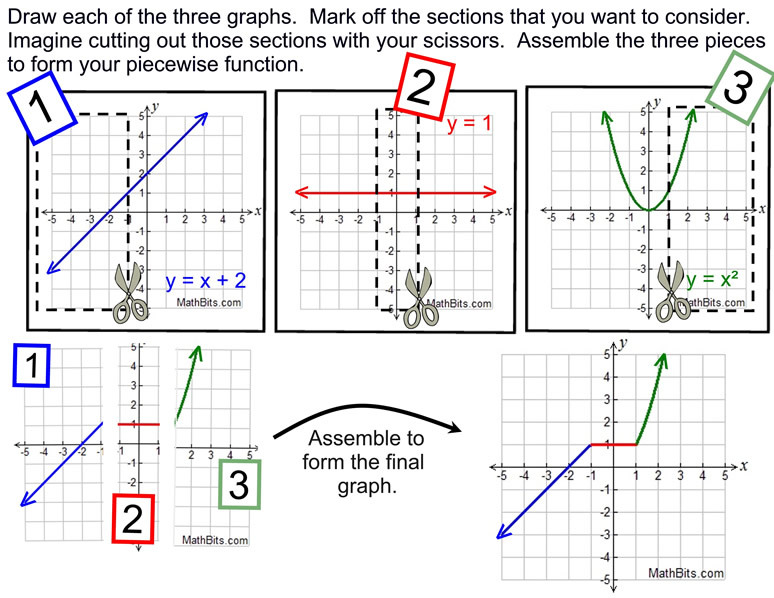 Try taking a look at each section as a "separate" graph, and grab your scissors! Piecewise defined functions may be continuous (as seen in the example above), or they may be discontinuous (having breaks, jumps, or holes as seen in the examples below). One of the most recognized piecewise defined functions is the absolute value function. Read more about Absolute Value. Range: When finding the range of an absolute value function, find the vertex (the turning point). • If the graph opens upwards, the range will be greater than or equal to the y-coordinates of the vertex. • If the graph opens downward, the range will be less than or equal to the y-coordinate of the vertex. is constant on each straight line section (ray) of the graph. A step function (or staircase function) is a piecewise function containing all constant "pieces". The constant pieces are observed across the adjacent intervals of the function, as they change value from one interval to the next. A step function is discontinuous (not continuous). You cannot draw a step function without removing your pencil from your paper. • may, or may not, be a function. Check with the vertical line test. This example is a function. One of the most famous step functions is the Greatest Integer Function. • the intervals on the greatest integer function can be expressed as [n, n+1). The value of the function on these intervals will be n. The function is constant in each interval. • you may see some texts using the notation y = [[x]] (double brackets). • it may also be referred to as the "floor" function and written as . This site will use the single bracket notation y = [x].